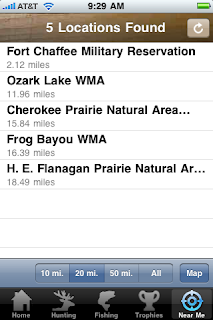 New Arkansas Game and Fish Iphone App. 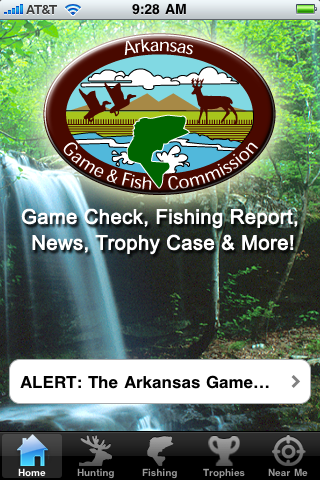 The Arkansas Game and Fish has shown it is on the cutting edge of technology with its release of a new I-phone app makes it easy to get the AGFC news, season dates, bag limits, WMA locations and check your game with your I-phone. The app was free and easy to install. One of the neatest things about the app is the "Near Me" tool that will provide you a list of nearby public hunting areas from your current location. This is a handy tool when visiting in-laws on the other side of the state where you may be less familiar with the local hunting opportunities. You can request a list of public hunting areas within 10, 20, or 50 miles of your current location. 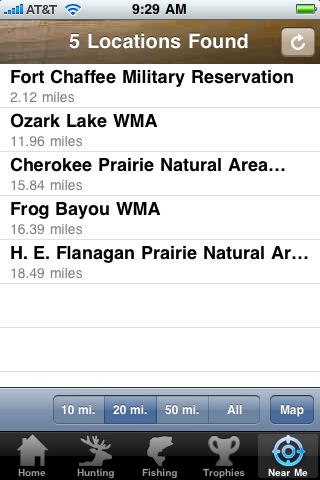 In my particular part of the state, Fort Smith, the program displayed 5 public hunting areas's within 20 miles. That is a lot of hunting opportunities. Once you select the area you would like to go visit the program provide you the website, phone number, and will map the driving directions for you from your location. I did notice that though the list included our National Forests the glaring absence of our local National Wildlife Refuges from among the list was puzzling. The program is new and the links often simply point the the AGFC web site (season & dates) I'm hoping that it will expand its mobile formatting in the future. But so far it's a great start that put our agency ahead of other state agencies and I'm proud to have it.